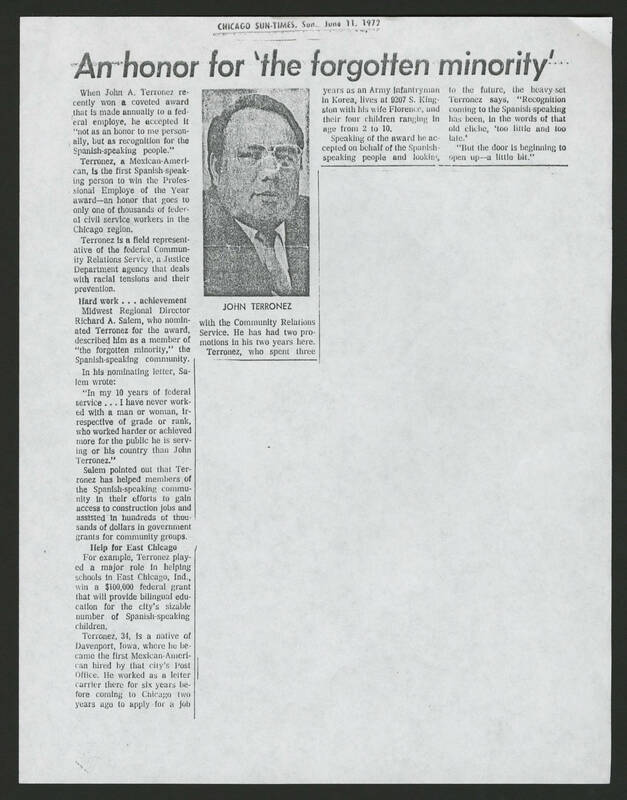 CHICAGO SUN-TIMES, SUN, JUNE 11, 1972 An honor for 'the forgotten minority' When John A. Terronez recently won a coveted award that is made annually to a federal employe, he accepted it "not as an honor to me personally, but as recognition for the Spanish-speaking people." Terronez, a Mexican-American, is the first Spanish-speaking person to win the Professional Employe of the Year award-an honor that goes to only one of thousands of federal civil service workers in the Chicago region. Terronez is a field representative of the federal Community Relations Service, a Justice Department agency that deals with racial tensions and their prevention. Hard work...achievement Midwest Regional Director Richard A. Salem, who nominated Terronez for the award, described him as a member of "the forgotten minority," the Spanish-speaking community. In his nominating letter, Salem wrote: "In my 10 years of federal service...I have never worked with a man or women, irrespective of grade or rank, who worked harder or achieved more for the public he is serving or his country than John Terronez." Salem pointed out that Terronez has helped members of the Spanish-speaking community in their efforts to gain access to construction jobs and assisted in hundreds of thousands of dollars in government grants for community groups. Help for East Chicago For example, Terronez played a major role in helping schools in East Chicago, Ind., win a $100,000 federal grant that will provide bilingual education for the city's sizable number of Spanish-speaking children. Terronez, 34, is a native of Davenport, Iowa, where he became the first Mexican-American hired by that city's Post Office. He worked as a letter carrier there for six years before coming to Chicago two years ago to apply for a job with the Community Relations Service. He has had two promotions in his two years here. Terronez, who spent three years as an Army infantryman in Korea, lives at 9207 S. Kingston with wife Florence, and their four children ranging from 2 to 10. Speaking of the award he accepted on behalf of the Spanish-speaking people and looking to the future, the heavy-set Terronez says, "Recognition coming to the Spanish-speaking has been, in the words of that old cliche, 'too little and too late.' "But the door is beginning to open up-a little bit."